The market attempted a break out today but could not overcome the 1986 resistance level and headed back down to close under the 50 DMA. And while the close under the 50 DMA is significant, the bearish camp is not making much progress by not being able to go under yesterday's low. The market has now been in a correction for almost 2 weeks and we could see a strong bullish rally if support keeps holding or if we get a capitulation bearish wave that gets immediately reversed. I went long today in the morning, sold profitably towards mid-day and I'm back to cash. 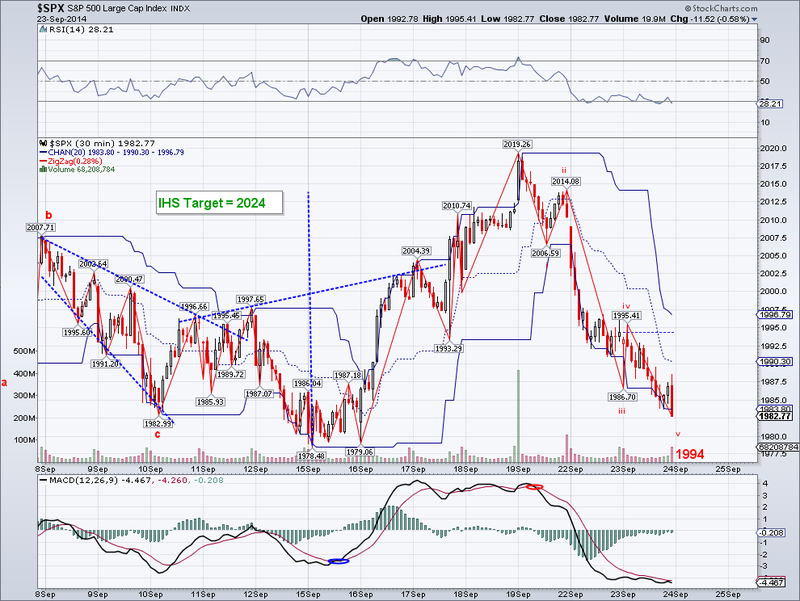 Might go long again if bears keep hesitating. The market seemed like it was going to sell off strongly early morning, but instead it reserved most of its loses by the end of the day. There is a Diamond Bottom pattern and one could argue for a 1-2 set up for both bulls and bears on the micro count, so this could go either way tomorrow. What's happening in Hong Kong doesn't help worldwide sentiment, but at the same time China just put in a 52 week high tonight. The irony is shares from Chinese companies trading in both China and HK see their stocks rally in the SSEC, while it sells off in HK. At one point, people that step in to take advantage of the price discrepancy of shares from the same company will make a killing. My guess is the market will hold to an excuse to do whatever it wants and then surprise most people as it usually does. I am on the sidelines until there's more clarity, but I am leaning towards going long if the low for today holds. The market bounced back somewhat strongly today, not only to test the 50 DMA but to close comfortably above it. But like the bounce earlier in the week, it also has 3 waves or a zig zag so we have to see if this wave turns into a 5 count or if it drops again Monday morning. 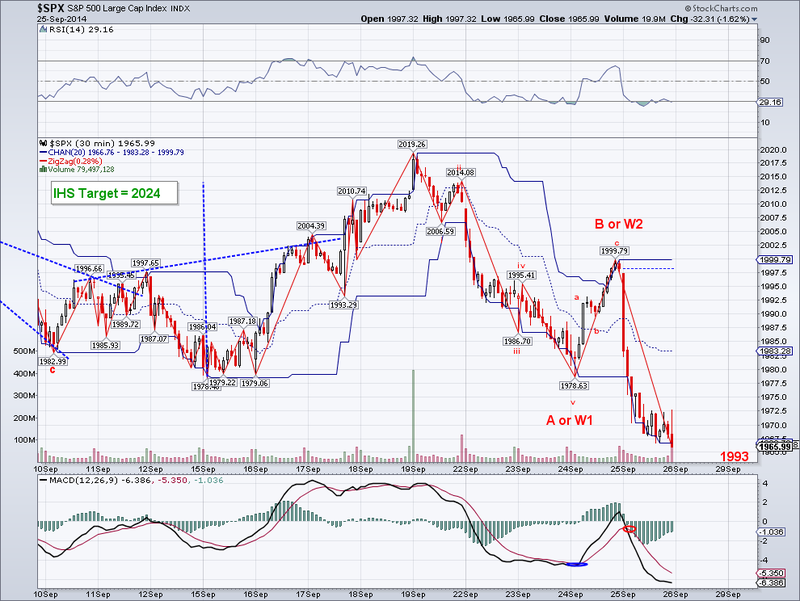 If the market sells off on Monday, then we might be seeing a bearish nested 1-2 that will most likely test the 1904 low. But if the market can put in a 5 count to anywhere near 1999, we might be seeing another Inverse Head and Shoulders with a 2034 target more or less. I did not get greedy today and sold all my longs when the 50 DMA was tested as planned, and I will wait for the next tradeable market pattern and have myself a stress free weekend :) So I either go short if the market goes for 1999 or long after selling exhausts near 1904. The market sold off today and broke its 1978 support as well as the 50 DMA at 1976. I was expecting the downtrend to continue after a test of 2010 given yesterday's strong reversal, but this one caught me by surprise. 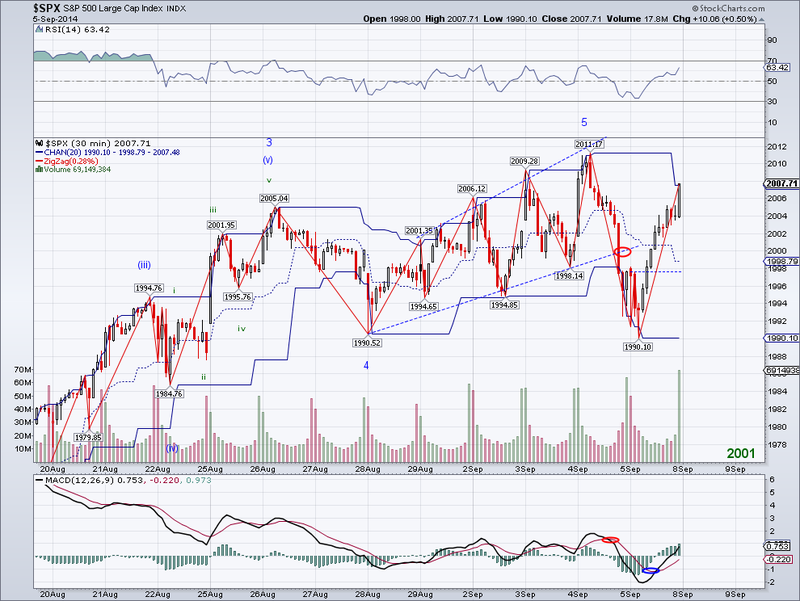 We now have a a clear 5 wave count to 1978 from the all time high and a classic abc move to 1999. 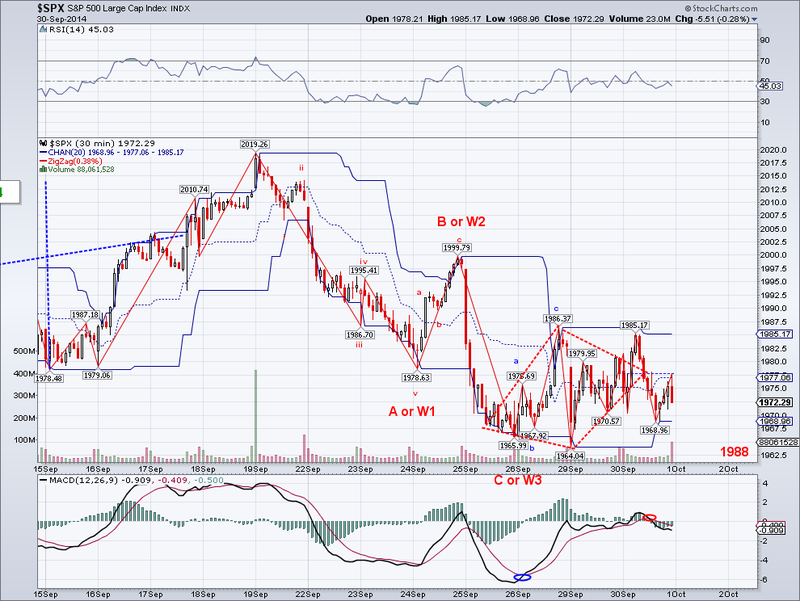 The current bearish wave is either a C or a W3 unfolding. An ideal C would bottom at 1959, which could happen in after hours or pre-market trading and would lead to a strong rally as soon as tomorrow. However, the market could just bounce to the 50 DMA/1978 level and sell off again in a nested 1-2 set up. I think it is likely the market will go down to the 200 DMA or at least test 1904 on this sell off, but it is too early to tell since there's not a single catalyst being used as the excuse to sell. In fact, not even the mainstream financial media knows what's behind the selling so it's all open to speculation. I got stopped out on my long position but I bought it back cheaper towards the end of the day in expectation of a 50 DMA test. I should have sold half yesterday and raise my stop, but got greedy so I am basically back to were I started.. I have to remind myself next time to sell, specially when the trend is bearish..
"Perhaps the plan is a 1978 test and then a bounce to form a right shoulder? We'll find out very soon." The market tested and found bottom at 1978 today as I speculated on Monday and now we'll see if the counter rally stalls to form a right shoulder of a Head and Shoulders. The counter rally has been strong and one could argue for a complete trend reversal. But the real test is overcoming the 2010 level for the bulls, so we'll see how the market behaves at that resistance level. I am keeping my longs and raising stops to just above break even, hopefully the market will form a good right shoulder so I can sell longs and go short there. But if the market manages to break resistance, I will just ride longs until a new all time high challenge. One fact worth noting is the daily MACD made a bearish cross couple of weeks ago and the market is still at the same level, so the longer the market keeps holding up, the slimmer the chances of a real sell off happening. We now have a clear bearish 5 count from the 2019 top with today's session. 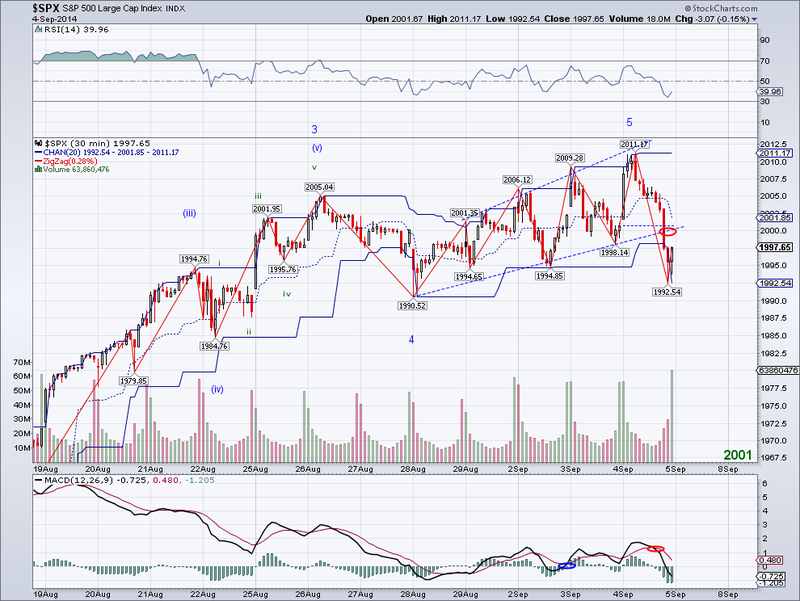 Also, the Trend Average has turned negative, so this wave from from 2019 is most likely an A or a W1 of a bigger correction. There is a also the death cross on the RUT which could signal an overall change in sentiment in the broader market, so maybe it is time for "the" correction we've been anticipating for months. Still, I'd like to see 1978 break before assuming the 1904 low will be tested. 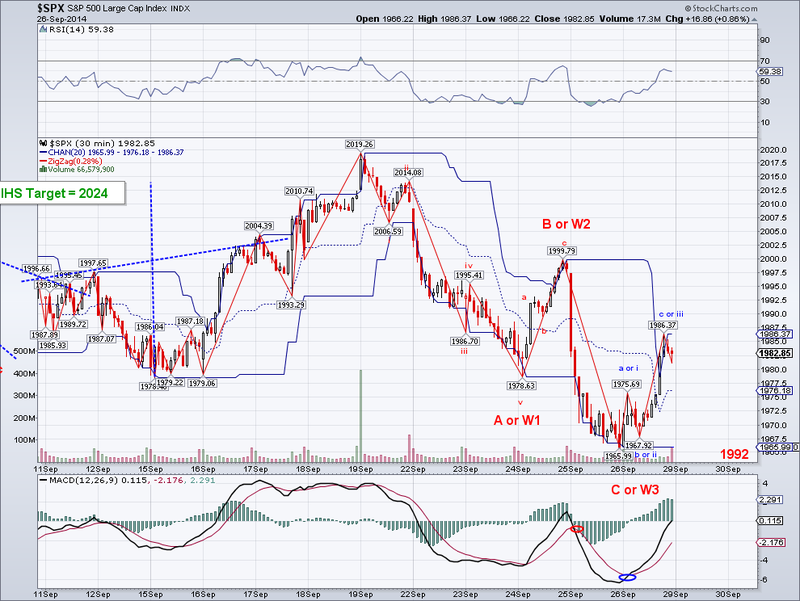 As it is, we should see a bounce starting tomorrow for a W2/B or right shoulder. 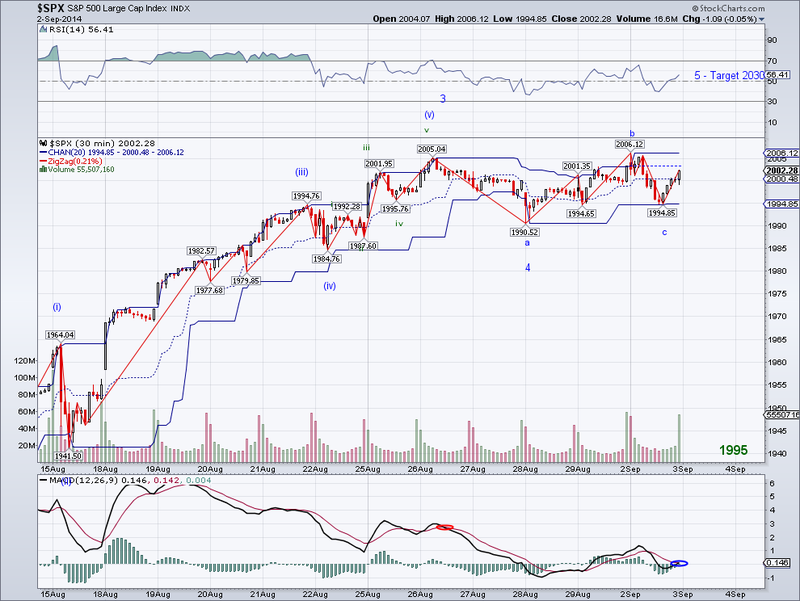 If the counter rally stalls around the 2010 resistance, we will have a good low risk/high reward short set up. I went long towards the end of the day but I am now basically looking to short once the market hits resistance. 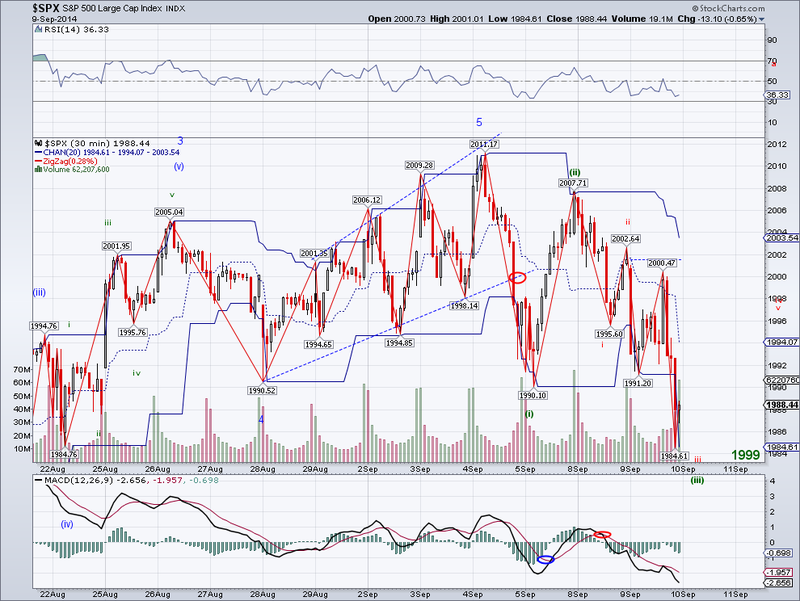 The market broke its uptrend support decisively today with what seems like a bearish W3 or a C wave. The close was under the Trend Average and the level I am looking at to confirm the start of a larger downtrend is a clean break of 1978. It's hard to label the wave from 1978 to 2019, but the higher high is usually a sign that we will see that level challenged again. So I am on a wait and see mode until we see something clear. 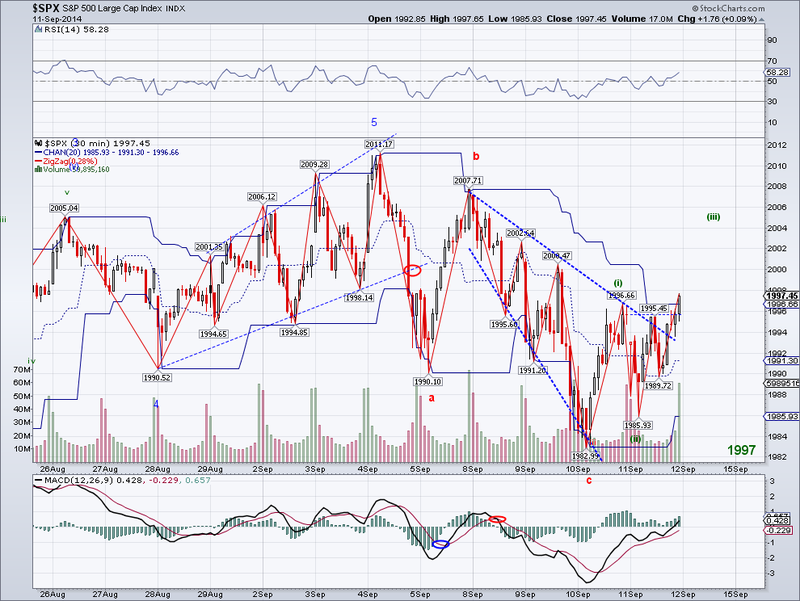 Perhaps the plan is a 1978 test and then a bounce to form a right shoulder? We'll find out very soon. The market finally broke out of range and put in another all time high today at 2019. However, I still think the waves look somewhat choppy, so I am not sure if the wave today was some sort of W3 or the last bullish wave from the 1978 low. A key level to watch is 2004.39, if that holds then we should see new highs. But if it breaks, then 1993 will be tested. I am also watching the possibility of a small H&S using 2006 as the neckline, an impulse from today's low to a new high would set up the pattern and give us a chance to make money on it :) Last but now least, looking at the daily chart I see the potential for a bullish MACD crossover and yet another IHS set up targeting 2095. If the market breaks out to the upside strongly next week, chances are it will be going for that target. I didn't buy Alibaba today as it went crazy and closed 30%+ above its IPO price. However, I will put it on my watchlist. If we finally get a sell off, I'd love to get this stock and Google. These are companies that will be around 100 years from now imo. Earlier this week I mentioned if the market recaptured the Trend Average, we should seen new all time highs. And today we got the first new all time high of possibly several to come. 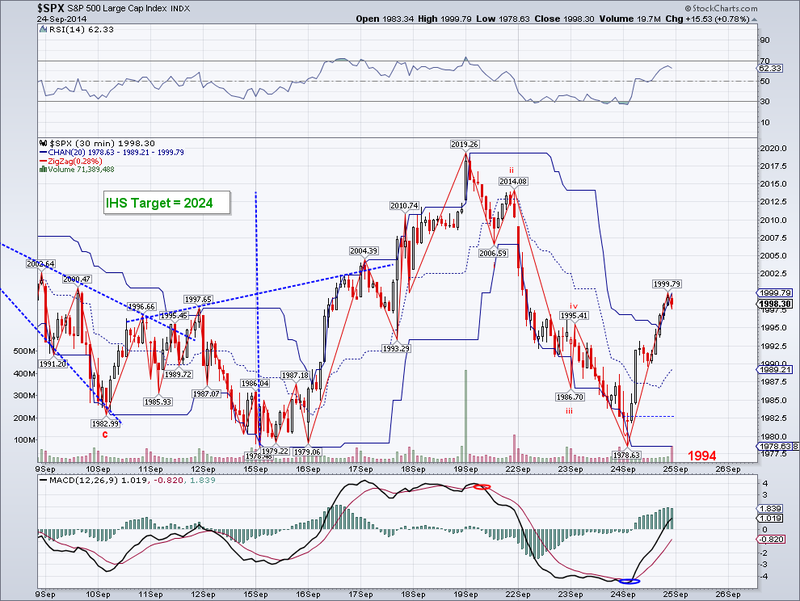 The market looks like it is going to gap up, so maybe we'll see the Inverse Head and Shoulder's target met tomorrow. Given the fact that Alibaba's IPO is finally coming tomorrow, I can see the bulls using the opportunity to go crazy. Personally, I am very tempted to buy it (Alibaba) but I probably will wait until there are enough sessions to calculate the trend. The problem is, we might see a very bullish week or two and I don't want to miss out on that. Now, with that said, I don't see a very clear micro count yet (I'm going mostly by the IHS pattern for now) and there is a possibility of a Rising Wedge or Ending Diagonal. So the market could sell off suddenly, but as I've been saying for several years now, trade with the Trend Average. DO NOT SHORT this market as long as the TA is Bullish unless you are 100% sure of what you're doing (meaning, you know where your stops are). 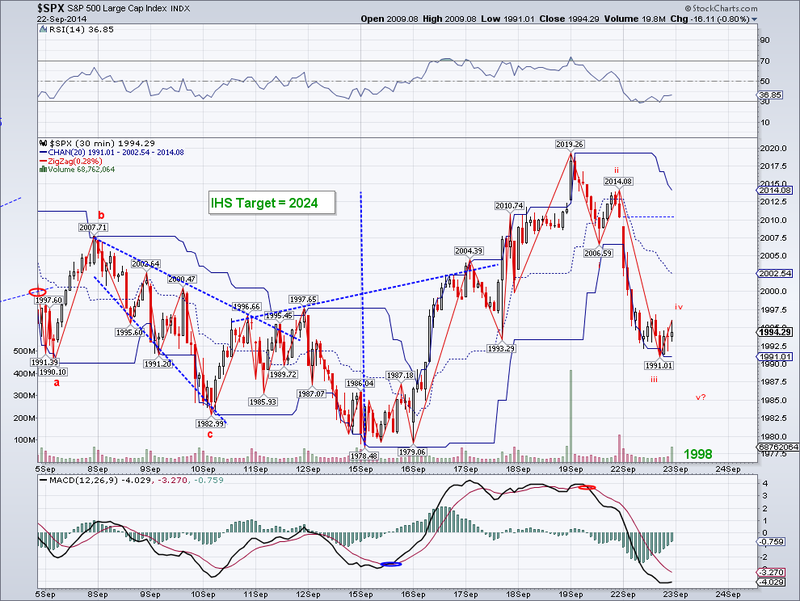 The market put in the Inverse Head and Shoulders pattern I was expecting yesterday and now the target is 2024. Also, the Trend Average is back to bullish so we might see another test before a rally to new all time highs. The one thing I am not too clear on is the micro count, so for now I am just going to follow the IHS pattern and let the waves evolve. Now that we got the Fed statement, we have a good excuse for the market to resume its rally. Additionally, the Alibaba IPO is coming soon and that might create a bullish environment as this is a behemoth in the Chinese market (as significant as Google is to the US). If fact, I will most likely buy some for my long term portfolio. I closed my shorts before the statement but not profitably as I had hoped as the market lingered at 1998-99 before it went down for a few seconds (the only time where I could have made a profit). I will probably short again but not until I see exhaustion. 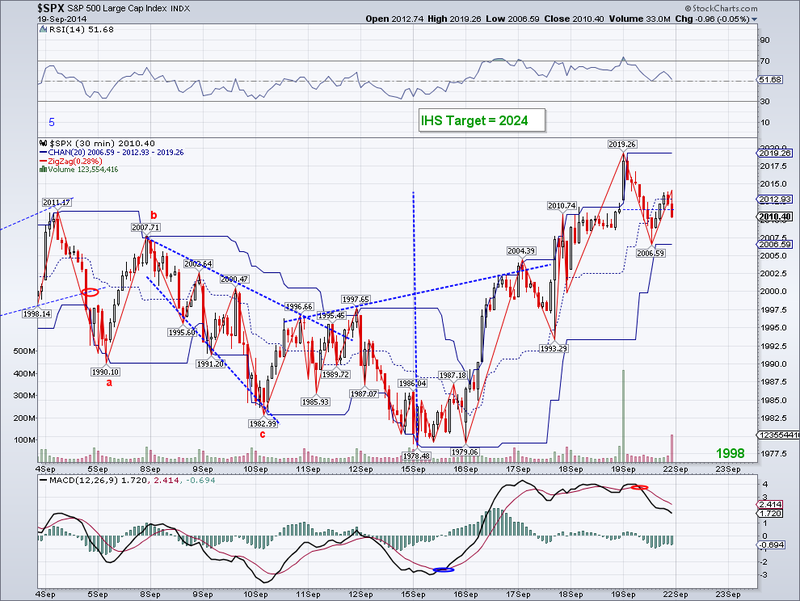 Bears need a strong reversal day to invalidate the IHS, otherwise this thing is going up. The market ended up rallying as expected to the 1997 level as I had expected and closed above the Trend Average. And I am looking at a potential Inverse Head and Shoulders forming, which could be just another test of the TA again or support in the 1983-90 area. 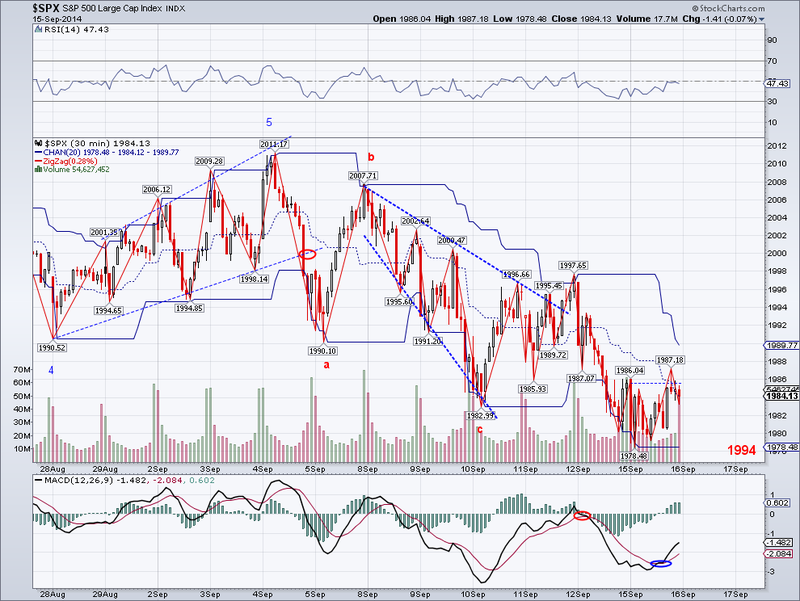 Trade under 1978 would invalidate this bullish set up. But given the strength of the bounce today, there is a good chance the market its done with its "correction". I went short at 1997 per my plan yesterday but will probably close this position as soon as it is profitable and probably switch to the long side. Bears had almost two weeks to make their case, but the market is just 0.5% off its all time high. The market completed the micro 5 wave count I wrote about on Friday but it fell a few points short of the 50 DMA before rebounding. Market direction is down but we should see a counter rally to possibly test 1997 (or the Trend Average) before the resumption of another bearish leg. 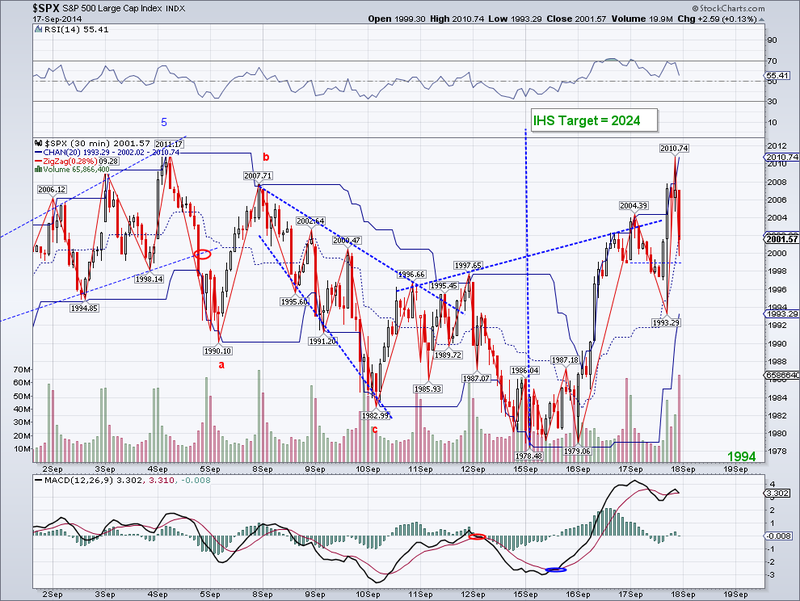 Now, if the market can gather enough bullish momentum to recapture the TA, then we should see new all time highs again. I should have taken a long position early morning but I waited too long/fell asleep. The market failed to hold above the 1989 level I mentioned yesterday and ended up putting in a lower low at 1980. I see 3 waves down so far from 1997 and we could see another bearish wave to test the 50 DMA at 1972 and complete a 5 wave move. All these zig zagging waves continue to buy time for the bulls (Implies a W4), so unless there is considerable downside in the next couple of weeks, there is a good chance we will see new all time highs again once daily oscillators reset. I was stopped out at 1989 with a minor loss, and I am going to be on the sidelines until I see the next trade opportunity. Perhaps, I will try going long at the 50 DMA and use a 5 point stop if we get there. The market should start a counter rally early next week. The market put in a higher low early morning and ended up breaking out of the expanding descending wedge as I had been expecting. All this choppiness in what is supposed to be a correction allows oscillators to reset and allow bulls to mount another charge. With the market closing right on the Trend Average, I can see a gap up or a bullish day tomorrow as long as 1989 holds. If we get a 5 wave count from the 1984 low, the projection is about 2015 which is not all that far from the wedge projection of 2020. I took a long position earlier in the day and my stops have been raised to 1989, so we'll see if the pattern turns out as expected. The market did not sell off as I had been hoping and instead it counter rallied to test the Trend Average towards the end of the day. 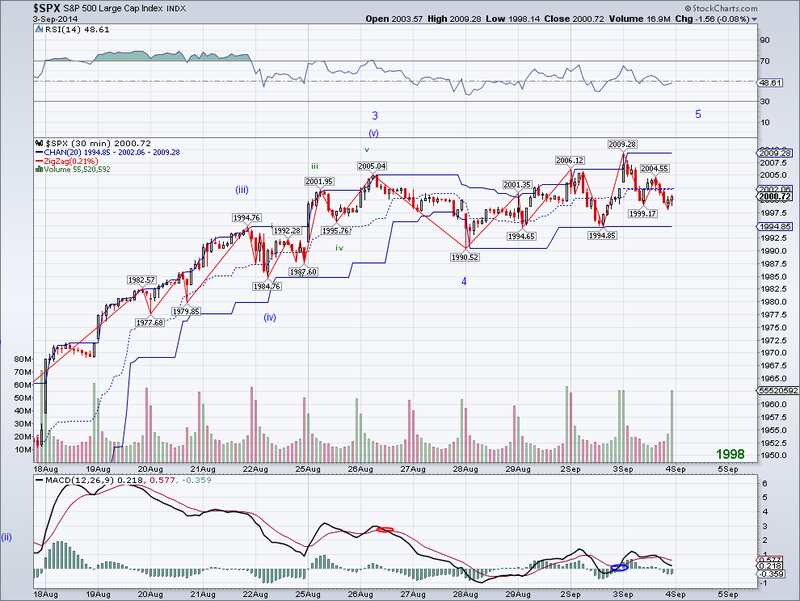 So, the count I had yesterday gets eliminated due to W4>W1 overlap and the pattern not looks more like an ABC correction. 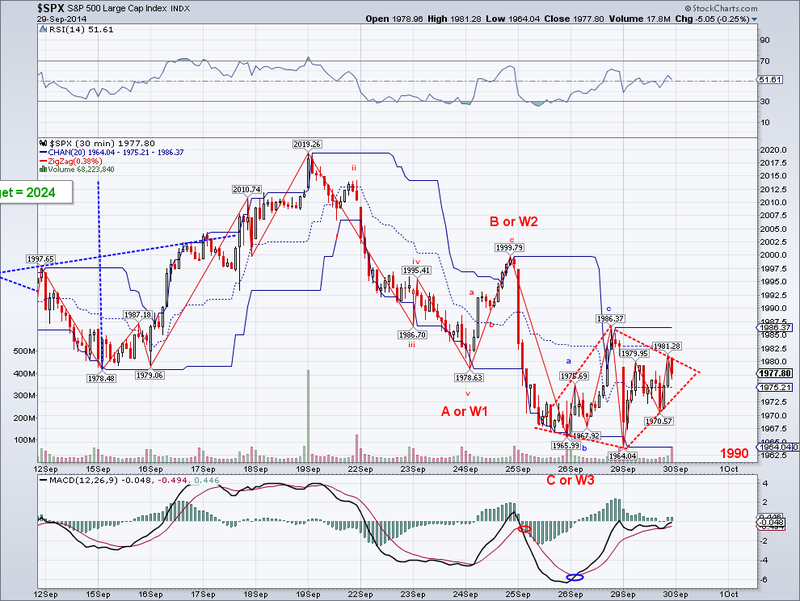 With the C wave being an expanding descending wedge, a pattern we don't see that often. 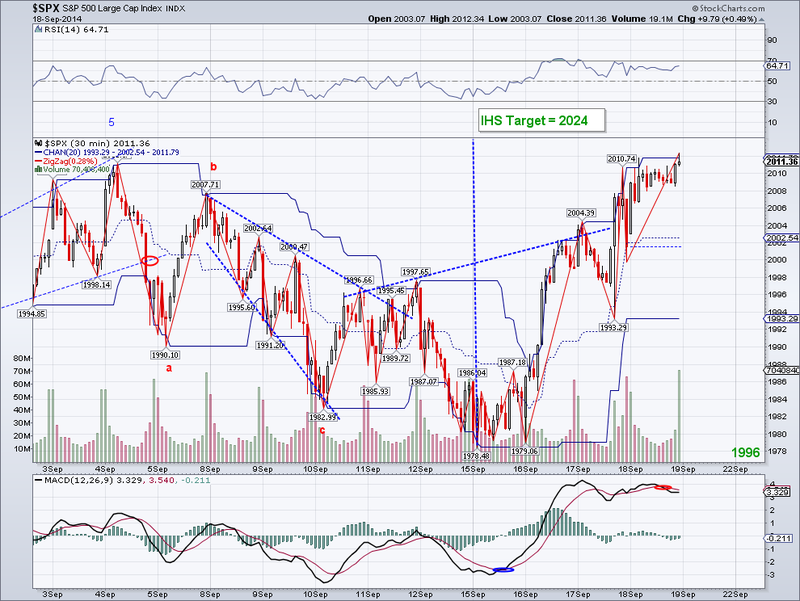 If the pattern breaks out to the upside (which it does 70% of the time), the target is 2021. 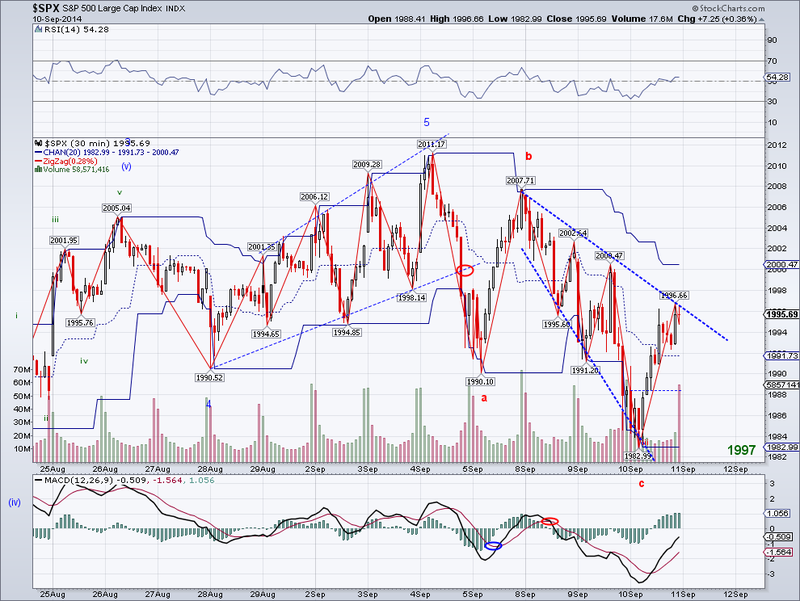 Still, the overall picture is mixed and the TA has turned bearish (by a very slight margin). In addition, the daily MACD has rolled over so even if we get that bullish wave, chances are the market is going to see a stronger correction. I covered my short at a profit once waves started to overlap and I will look out for another short set up once I see trade set up again. We finally had some guidance from the market today and it looks like it is going down. The break of 1990 will most likely result in a test of the 50 DMA at 1971, so now we have to see if we get 3 waves that gets a strong bounce from the 50 DMA or 5 waves to test support at 1952. Looking at the daily chart, the MACD rollover is imminent, unless there's a bullish miracle. 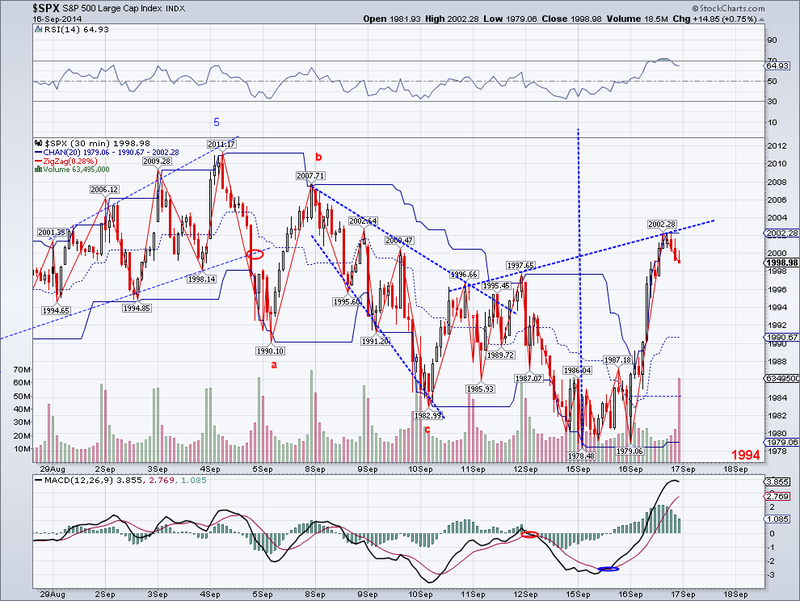 I can see a Head and Shoulders forming if we get a bearish wave that gets stopped around 1900. 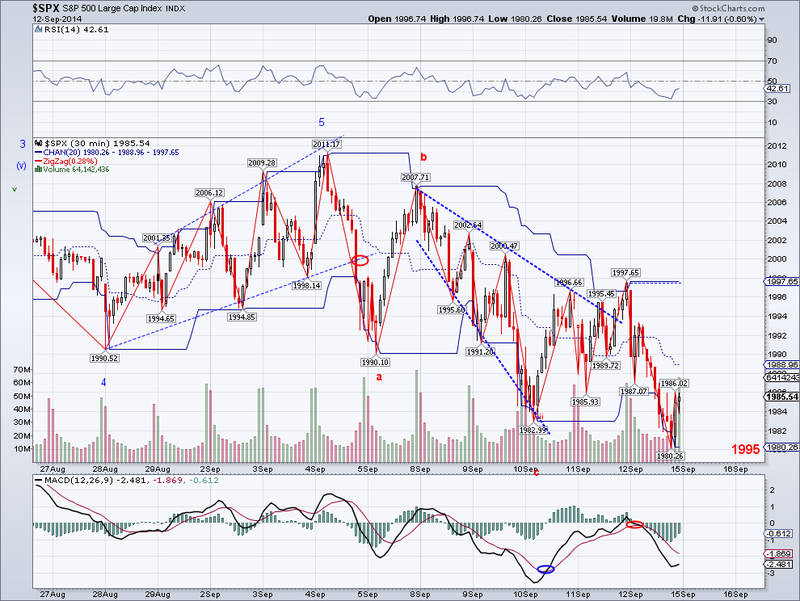 But I also like the idea of an expanded flat where this bearish wave finds a bottom at the 200 DMA. 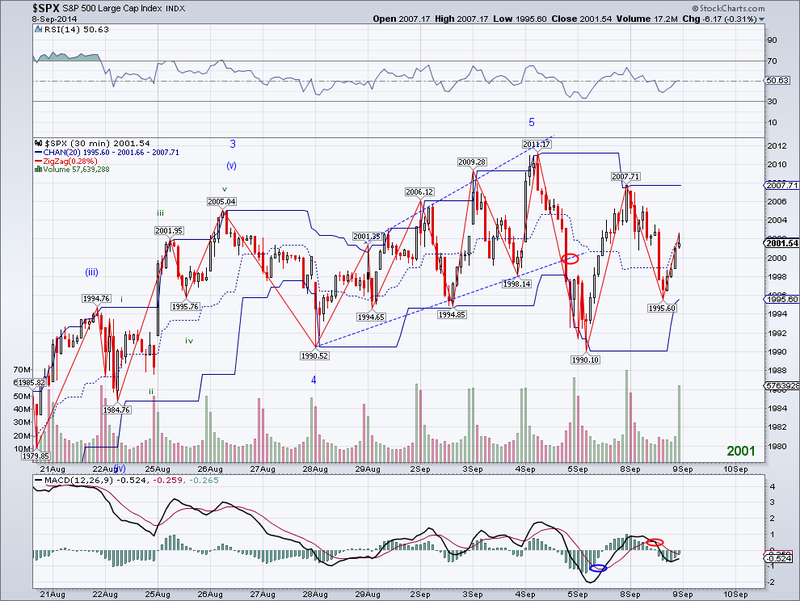 I am already short, so I will just keep adjusting my stops to the TA or wave peaks/turning points. At this point, I will lower my stop to 1991, which already makes this trade profitable. And obviously, if the market is able to recapture the TA then we'll have to scratch the bearish targets and look for new clues. We didn't get follow through buying today and the short term pattern can be interpreted as a 1-2 for both bulls or bears. But basically, the key markers are the all time high or the 1990 support level. A break of either one, confirms what will most likely be a W3. The market also closed right on the Trend Average, which is as neutral as it can get. There is however a Diamond Top like pattern and the daily MACD wants to rollover, so we could be at the top already or like I said last week, we get one final leg up before the real correction starts. I am keeping my short position but now lowering my stop to 2007. The market was able to stage a decent counter rally today after bouncing off 1990 support, so there's a good chance the "head" is forming for an H&S. Obviously, it is very early to speculate on this pattern but we've spotted quite a few on here during similar stages. I went short anyway just in case but my stop is the all time high at 2010, so we'll find out early next week if the market has enough momentum for another ATH. Once the top is in, we will have to start guessing how strong the pullback will be. I just read some research from Deutsche Bank about 10% corrections and it makes me wonder if we are even going to see one until the next recession. It's been 563 days since the market pulled back 10%, which is longer than average. However, there was an 1800+ day streak in the 90's and a 1200+ day streak that started in 2003. Therefore, we might continue to see shallow pullbacks and then more rallies. According to the article, 10% corrections tend to cluster around recessions and economic crises, which makes total sense since the stock market is a reflection of the underlying profits of companies being traded. So as long as the economy is growing, put the your money in the markets. Also, another factor that might contain pullbacks is the just announced QE in Europe. A lot of that European money is going to flow to the US and Emerging markets, creating a favorable worldwide environment for stocks. Whether QE will work in Europe is another question, but given the US example, I think they will manage to prevent deflation and create enough liquidity for growth. Bernanke is looking like a genius now days as he was the chief architect of this formula. The market made it's 3rd all time high in a row and reserved at the end of the day. However, unlike other reversals, this one ended below the Trend Average so I think this is the clue the top is in or the "neck" for a Head and Shoulders is being set up. Going by my estimates, if we assume today's reversal wave from 2011 to 1992 is W1 or A, then I expect the 50 Daily Moving Average at 1968 to be tested in the next session or early next week. With that said, there is support at 1990 and the Trend Average remains bullish and if the market is able to put in another all time high, then that formation will likely be the head of an H&S. I will get into a short position once I see a clear set up. On a sidenote, I just read this on the news. I'd like to see Putin put the Ukraine thing on hold and take on the ISIS challenge. Obama might "not have a plan" since he is so politically correct/wishy washy, but Putin will in no uncertain terms try to obliterate these nutjobs. The market made another all time high today in the morning before reversing to test the 1995 support level/Trend Average. There are several ways to look at today's price action but the ultimate outcome is basically the same, new all time highs are coming in the next few days as long as the Trend Average holds. The market is fearless despite all the bad things happening around the world, so as much as I'd like to see a 10%+ correction after the wave structure is complete, we might get another quick correction and then another rally to trap the few bears still standing.